This is a guest blog from Amanda Polchies of Elsipogtog First Nation. Amanda was part of the grassroots community resistance to tell Texas-based SWN Resources that there would be no fracking used to explore for oil and gas in New Brunswick in 2013. Below you will find Amanda's account of October 17, 2013 when RCMP raided their peaceful protest camp - targeting elders and children with pepper spray and rubber bullets - to intimidate the protesters into submission. But the community's fierce determination to protect their land, water and their people eventually won them an indefinite moratorium on fracking in the province. If you would like to learn more about the community's story and see the specific protest event that Amanda describes below, please join us on Thursday, March 22 for a FREE screening of the film Water Warriors (2016). The evening will feature two film screenings, a keynote address from filmmaker Jane Hammond and a panel discussion about fracking and how to resist fracking in your own community. I would like to introduce myself first. Hello my name is Amanda Polchies I am a Lakota Sioux and Mikmaq woman and I live in Elsipogtog First Nation. I am the woman who knelt in the road with my feather and prayed in front of a line of armed RCMP officers. They were hired by SWN Resources to raid our peaceful camp on highway 134, just outside of Rexton New Brunswick. October 17, 2013 started off with a call out on Facebook for help. The 134 highway camp had been raided and our Warriors had been arrested. The call out for help was clear. Everyone who could get to the camp should. Videos emerged of armed RCMP and tactical armed force units pointing guns at women, our children and our elders with footage of attack dogs barking viciously wanting to be let lose on my people. I couldn’t watch anymore and knew I had to be there with my people. I heard the call out and I was going to answer. I didn’t know how I was going to help but I knew I needed to be there. My head was pounding and I had a fever of 101 but I couldn’t just stand by and do nothing. I kissed my baby son. Told him I loved him and gave him a hug. He looked at me and smiled. I gave him to my sister in law and left. I jumped in my car with 3 others and we headed out. When we arrived the first line of RCMP had already been broken through. There were people everywhere. I found a place to hide my car out of the way and made my way to the front of the line. I could see a line of black across the road. As I got closer I realized it was the RCMP, all men armed with shot guns, mace, zip ties. Everything they would need to subdue dangerous criminals. They were scared. I could see the fear in their eyes as they scanned the crowd of my people. The unease as they stood looking out at all the people who had answered the call for help. On the other side was a line of women - young, old, mothers, sister, wives, daughters - all with arms linked standing so beautiful and proud. On the ends were women playing drums singing our songs, holding their drums showing the RCMP they were not afraid. An elder was walking the line praying with her rosary. She would stop, say a few words and then keep going. When she got closer to the side I was on, I could feel the energy change. I knew something was going to happen. Just at that moment I heard a scream and the crowd moved. The two lines merged. People were screaming and pushing. I heard a loud bang and the crowd behind me moved forward. I pushed RCMP and they pushed back. A spray shot over my shoulder and I heard a woman scream. I looked over and saw my elder had been maced. Another woman came at the line and instantly got a blast of mace. I couldn’t move, I was surrounded by people. A second later the line broke to become two lines once again. I looked around and saw drummer women pointing at the RCMP who had sprayed our elder, while another woman washed away the burning tear gas from another's face. It went on like that for a few more hours. Every time the lines would merge there would be shots ringing out and more mace sprayed. People being dragged across the line and being arrested. At that moment I heard a young girl screaming out for them not to touch an eagle feather that one of the boys - who had been arrested - was holding. I don’t remember exactly what I did or said but the next thing I knew, the girl hands me her feather. I’m standing there looking at this feather in my hand and I hear a voice tell me to pray. So I knelt down and started to pray. I prayed for all the women who I had seen in pain from being sprayed. I prayed for my elder who was in pain. I prayed that nobody else would get hurt. On both sides. I heard footsteps around me and I opened my eyes to see my friend offering tobacco. She made a circle around me, knelt down and started praying. I looked to the other side of me and there was another woman, and another, all kneeling down and praying with me. I felt the hands on my shoulders of women on both sides of me. There were men on the ends watching us and praying. I heard a voice on the other side of the line say they were moving. The line of RCMP started shouting “MOVE BACK!!! MOVE BACK!!! MOVE BACK!!!" I was told to get up as they were coming, but I said no. The other women got up and moved. My friend and I stayed on the ground. I closed my eyes and everything got dark. I heard one RCMP say as he passed me "she’s not scared." Then I opened my eyes and there were no lines - only my friend and I were sitting there. Two RCMP rush over to me, pushed me face down on the road and zip tied me. By that time, the RCMP vehicles had been set on fire so there were huge clouds of black smoke rising up above the trees. We stood there, me in handcuffs with my arresting officer just watching the cars burn and the smoke rise. After a few minutes of standing there watching in amazement, the RCMP officer turned to me and said, "Are you ready? I have to take you now." So we turned and walked down the road as the cars burned and the trail of thick black smoke filled the sky. I created this piece out of the emotions I felt when I witnessed the violence towards the Elsipogtog community and read the media's biased portrayal of the event. I was really moved by the way people honoured the land and water, standing up for everyone. Often in media coverage of such events we hear that peolpe are 'protestors' - I dont like the term protestor. I feel when people stand up like this they are exercising their responsibility to protect the relationship to their territories. Sometimes I find the way people tell the story influences how people will see an event and I really wanted to paint the strength and beauty found in enacting traditional laws and responsibilities, to show that there is medicine in the strength of the people. That is why I painted plants growing out of the concrete under Amanda - because each time people assert their responsibilities to make things right - to stop destructive corporations - life is allowed to continue its cycle and growth. 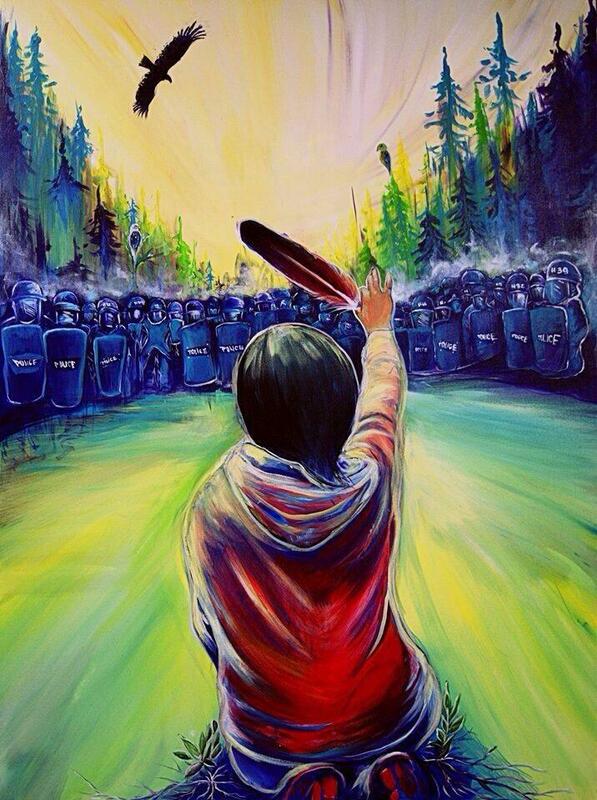 This painting was a humble way in my heart to show gratitude to what the Mi'kmaq people did for all of us living! We wish to say thank you/miigwech to Amanda and Fanny for sharing their stories with us here on our blog. We are grateful for what they have shared with us, helping us to learn about the importance of standing up to protect water and the role of art in communicating outside-the-box of traditional media, to help people feel why resistance is crucial to protecting people and the planet. Hydraulic Fracturing (or 'fracking') blasts a mixture of water, chemicals and sand into a well to break apart the rock formations and release previously inaccessible oil and natural gas deposits. This process uses large amounts of fresh water, which becomes contaminated with chemicals and is later disposed of, often in ways that are not environmentally responsible. Communities around the world have witnessed first hand the negative effects of fracking on health, the environment and drinking water. The need to protect clean water often flows through the motivation for community resistance to companies who want to use fracking in the exploration process. To learn more about the issues surrounding fracking and how to successfully say 'frack off' to fracking in your community, join us for our FREE World Water Day screenings and panel discussion on Thursday, March 22 where we will be showing the Toronto Premiere of Water Warriors (2017), a beautiful account of the resistance to fracking in New Brunswick, and the North American Premiere of A Fractured State (2016) about the ongoing struggle against fracking in Australia. You can watch the trailer for both films and read more about our panellists on the event page here.